The U.S. Constitution is one of the most important documents to people in our country. It is the basis for the system of law in our country. It is a very important written document that sets up the rules for our government and gives people important rights. All over the world, other countries have used our Constitution as a model for how they have set up their own government. Our Constitution has lasted over 200 years. Some changes have been made as our world has changed, but the main ideas in it have served our nation well. In the past and today, we live by its rules and enjoy the freedom it established for all Americans. In 1775, the American Revolution began. Colonists in America went to war with Britain to gain freedom. On July 4, 1776, the Declaration of Independence was signed, saying that America would be free from British rule. It was a long hard war, but finally in 1781, the colonists won and began to form a new nation. They wrote a document called the Articles of Confederation. The Articles of Confederation gave the country the name the United States of America. It also established a sort of friendship among the states. However, each state remained separate and sovereign. Each state made its own rule, and there was no central government. There was no president and no federal courts. After the war, there began to be problems with this. There were disagreements over how war debts were to be repaid. Different states had different ideas about things. In Shays’ Rebellion, a group of farmers angry about debts and taxes fought the Massachusetts government. There was no strong national government to help. All of these problems worried the leaders in the new United States. They thought that the nation needed a stronger national government. They decided to meet in Philadelphia in May of 1787 to change the Articles of Confederation. This meeting was the Constitutional Convention. Each of the 13 states were invited to send peopled called delegates to the Constitutional Convention. Each state decided to send people except Rhode Island, because they didn’t want a new government. A total of 74 delegates were selected to attend. The delegates were the most important men in politics. Many had fought in the American Revolution. Most were political leaders in their states. Of the 74 selected, 55 actually came to the convention. George Washington from Virginia was the general in charge of the American troops in the American Revolution. A great leader in our nation’s early history, he attended the Constitutional Convention. Early in the meeting, he was chosen to lead the meeting. He was a humble man, but agreed to lead the convention. Benjamin Franklin of Pennsylvania was the oldest delegate. At age 81, Franklin was a distinguished leader who had helped write the Declaration of Independence. Alexander Hamilton was a delegate from New York. Hamilton was a trusted aide to Washington during the war. He later became a lawyer and felt strongly that the United States needed a strong national government. There were a few important men that didn’t attend the convention. Thomas Jefferson was in Paris as an ambassador. John Adams was an ambassador in London. This group of men were great thinkers and great leaders. They would be known as the founding fathers of our nation. They were the writers or framers of our Constitution. Before reading on, answer these questions. 1. Which document said that America was free from British rule? 2. Which document established a “friendship” among the states, but let each make their own laws? 3. Which document set up the parts of our government? 4. Who was chosen to lead the Constitutional Convention? 5. Who is called the “Father of the Constitution” because of his important role? When the 55 delegates met on May 25, 1787 in Philadelphia, they met in secret. No reporters or outsiders were allowed. The delegates did not discuss the meetings with other people. The reason was that they wanted to be free to discuss the issues without outsiders trying to influence them. As the delegates from different states met, they had several disagreements. Those from larger states thought that larger states should have more votes. The smaller states thought that each state should have an equal vote. As a compromise, two houses of the legislature were planned. The Congress would have two parts: the House of Representatives and the Senate. The House of Representatives would be divided by population. Larger states would have more representatives and more votes. The Senate would have an equal number of representatives from each state. Another disagreement then broke out over how to count slaves when determining state population. States in the South, which had many slaves, wanted slaves to be counted, so they would have more representatives. States in the North did not want slaves to be counted. In a compromise, the delegates agreed to have each slave be counted as three-fifths of a person. The issue of the presidency caused further disagreements. Would there be one president or a group of executives? How would the president be elected? Would he serve a lifelong term or some shorter term? The final compromise resulted in one president who would be elected by an electoral college. The president would serve four-year terms, but could be re-elected. After these major issues were resolved, a small group of men worked on the final language of the document. On September 17, 1787, the Constitution was signed by the framers. It would not become final until the states ratified or approved it. There was still debate among the states about the Constitution. Those who supported it were called Federalists. People who didn’t want the Constitution were called Anti-Federalists. Finally, in July of 1788, the ninth state ratified the Constitution, making it the supreme law of our land. There are many important ideas in the Constitution. One such idea is called the rule of law. This means that no one is above the law. Even the president and other people in the government must obey the law. The Constitution says, “This Constitution…shall be the supreme Law of the Land.” This also means that no laws can be made that go against the Constitution. This makes the Constitution very important and strong. This branch of government makes sure the laws of the nation are obeyed. In our federal government, this branch is the President and Vice President. This branch of government makes the laws. In our federal government, this branch is the Congress. This branch of government interprets the laws. The judicial branch says what laws mean and checks that they don’t disagree with the Constitution In our federal government, this branch is the Supreme Court. This is the highest court of the land. 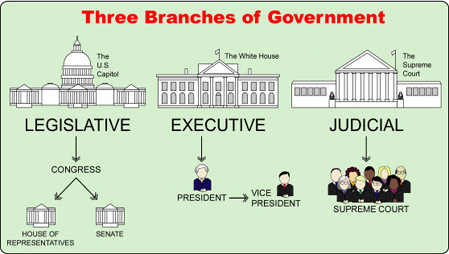 The Constitution made these three branches so there would be a separation of powers. This means that each branch is separate. They are all important in their own way. The framers of the Constitution wanted to make sure that there were checks and balances among the different branches of government. Each branch has some power over the others. For example, if the Congress makes a law that doesn’t agree with the Constitution, the Supreme Court can overrule it. If the President takes actions that are beyond his job or the law, the Congress can refuse to provide funding or even impeach the President and take away his job. 6. Which house of Congress has an equal number of representatives for each state? 7. Which house of Congress has more representatives for larger states? 8. Which branch of government makes the laws? 9. Which branch of government enforces the laws? 10. Which branch of government says what the laws mean? 11. Which of these is the most important in our government? The Constitution begins with the words “We the People of the United States, in order to form a more perfect Union.” This tells that their goal in writing the Constitution was to make the nation a better place. The very beginning of the Constitution is called the preamble. After the preamble, there are seven major parts or sections of the Constitution. These are called articles. For example, Article I of the Constitution tells how the legislative branch of the government will work. It defines the Congress, how it will be elected, what powers it has, and how it will work. Each article in the Constitution has several sections that give all the details. The framers wanted the Constitution to be the law of our land for a long, long time. But they also knew that the nation would change, and that there might need to be changes to the Constitution. So, they made a way for the Constitution to be changed or amended. Over time, many amendments or changes have been made to the Constitution. Each one is numbered. There have been 27 amendments so far. The first 10 amendments tell about basic rights that Americans have. These 10 amendments together are called the Bill of Rights. One concern that some people had about the original Constitution was that it didn’t guarantee people any freedoms. Because the American Revolution had been fought for these freedoms, this was very important. To guarantee these rights, 10 amendments were added to the Constitution. These are known as the Bill of Rights. These amendments were ratified by three-fourths of the states on December 15, 1791. Some of rights guaranteed by the Bill of Rights are the freedom of religion, freedom of speech, and freedom of the press. The U.S. Constitution has survived for over 200 years. It is called a living document, because it was lasted so long and sometimes changed with the times. Think about how much the world has changed in 200 years. When the framers wrote the Constitution, there was no television, no cell phones, and no Internet. And yet, they wrote a document that can still be applied to all these new technologies. How has the Constitution survived so well? Well, one thing the framers did was to write the Constitution very generally. Instead of making very specific laws, they wrote about general principles. This sometimes makes the Constitution difficult to interpret, but that is the job of the Supreme Court. The Supreme Court plays a critical role in interpreting the Constitution and making it a living document. 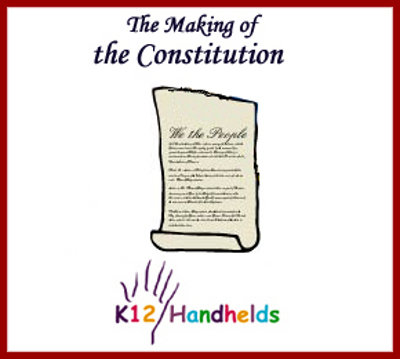 The framers also created a way to change the Constitution through amendments. They made it very difficult to pass amendments though. They wanted to make sure that changes were carefully considered and agreed upon. Only 27 amendments to the Constitution have been ratified. The last one was ratified on May 7, 1992. 12. What is the “rule of law”? Why is it important? 13. What checks and balances are built in to our government? Why? 14. Why is it important that the Constitution is a “living document”? 15. What Constitutional issues are raised by new technologies like the Internet that didn’t exist at the time the Constitution was written? How does the Constitution and our government deal with these issues? May, 1775 - The First Continental Congress meets in Philadelphia. They write a letter to the king of Britain complaining and asking for his help. April, 1775 - The first gunshots are fired in Lexington and Concord, Massachusetts beginning the American Revolution. July 4, 1776 - The Declaration of Independence is signed. 1781 - British troops surrender at Yorktown, Virginia. 1781 - The Articles of Confederation take effect. 1783 - The British and the United States end the war by signing the Treaty of Paris. 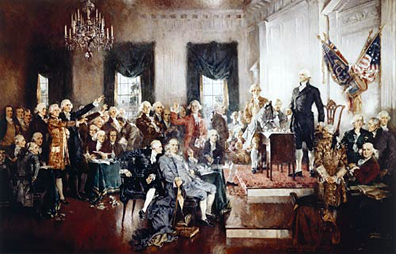 May 25, 1787 - Constitutional Convention begins in Philadelphia. September 17, 1787 - The Constitution is formally signed. December 7, 1787 - Delaware is the first state to ratify the Constitution. June 21, 1788 - New Hampshire is the ninth state to ratify the Constitution, causing it to take effect. December 15, 1791 - The Bill of Rights takes effect after being ratified by three-fourths of the states. February 7, 1795 - Amendment 11 is ratified, protecting states from some suits in federal courts. June 15, 1804 - Amendment 12 is ratified, changing the way the President and Vice President are elected. December 6, 1865 - Amendment 13 is ratified, abolishing slavery. July 9, 1868 - Amendment 14 is ratified, dealing with citizenship, congressional representation, insurrectionists, and public debt. February 3, 1870 - Amendment 15 is ratified, guaranteeing the right to vote regardless of race. February 3, 1913 - Amendment 16 is ratified, giving Congress the right to impose income taxes. April 8, 1913 - Amendment 17 is ratified, discussing how Senators are to be elected and replaced. January 16, 1919 - Amendment 18 is ratified, prohibiting alcoholic beverages. August 18, 1920 - Amendment 19 is ratified, giving women the right to vote. January 23, 1933 - Amendment 20 is ratified, establishing the start of presidential terms and Congressional sessions and setting the process for replacing the president in case of death. December 5, 1933 - Amendment 21 is ratified, repealing the ban on alcoholic beverages. February 27, 1951 - Amendment 22 is ratified, limiting each president to two terms in office. March 29, 1961 - Amendment 23 is ratified, giving the District of Columbia residents a vote in presidential elections. January 23, 1964 - Amendment 24 is ratified, eliminating any poll taxes. February 10, 1967 - Amendment 25 is ratified, establishing a plan for succession in event of the death or resignation of the president or vice president. July 1, 1971 - Amendment 26 is ratified, setting the minimum age for voting at 18. May 7, 1992 - Amendment 27 is ratified, saying pay raises for members of Congress won’t go into effect until the next session of Congress.